The improved version of Grand Theft Auto V for PlayStation 4 and Xbox One will be out on November 18, according to the game's developer, Rockstar. The PC version will follow on January 27, 2015. The company says the new edition of the massively popular game will contain new weapons, vehicles, activities, wildlife, and other technical advancements. Rockstar is promising at least 100 new radio songs, too. Rockstar is also bumping up the GTA Online player limit to 30 for PS4/Xbox One players, they say, though there's still no word on when they'll be adding the much-requested heist system. There's also no word on if or when we'll ever see some sort of single-player downloadable content for Rockstar's ambitious open-world game. As good as the game looked on the outgoing generation of consoles, a better-looking version of the game that would be designed for the newer PlayStation and Xbox as well as the PCs was long expected. That version was announced this past June at the E3 gaming trade show. At E3, Rockstar showed a trailer for the new version. But the company didn't provide a lot of detail about what exactly would be different. A press release at the time promised "increased draw distances, finer texture details, denser traffic, and enhanced resolutions" as well as "new wildlife, upgraded weather and damage effects, and an array of new details to discover." GTA V sported a multiplayer mode that was released a few weeks after the base game. Called Grand Theft Auto Online, it let players collaborate or compete in criminal activities sprinkled across the GTA V map, though many players used that version of the game for more peaceful things like creating bike-stunt videos and landing helicopters on top of airborne jets—really, whatever they could think of in the GTA's playground of vehicles, guns and forgiving physics. Rockstar had previously said that player progress in the Xbox 360 or PS3 versions of GTA Online would carry over into the new versions, presumably through the development studio's online Rockstar Social Club system. Rockstar has supported GTA Online in the year since its launch with regular releases of free packs of missions, weapons, vehicles and outfits while also charging for some desirable items. The company had missed a self-imposed spring deadline for the supposed crown jewel of GTA Online, multiplayer heists. 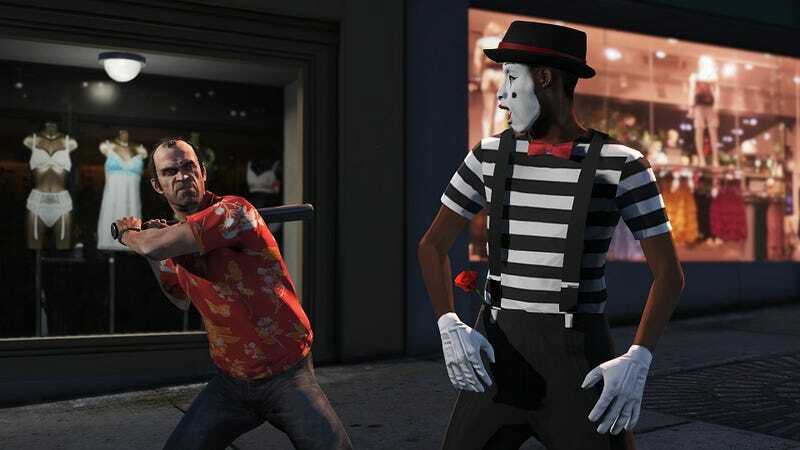 Most recently, Rockstar apologized to fans, saying heists were missing spring but were still coming. Last December the company also teased what sounded like a significant expansion to the game's single-player campaign for some time this year: "we have big plans for substantial additions in 2014 continuing Michael, Franklin and Trevor's action, mayhem and unexpected adventures in Southern San Andreas."